Sundazed presents the second installment in its landmark Jimi Hendrix singles series, which honors the legendary guitar icon's singular musical genius by presenting it in the same medium in which it was originally experienced by fans: vinyl. 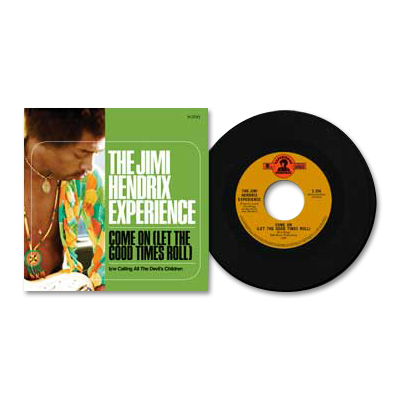 The series' latest release once again pairs two vintage Hendrix tracks, combining his visionary reading of Earl King's R&B classic "Come On (Let the Good Times Roll)" alongside the Hendrix original "Calling All the Devil's Children." The former track, which Hendrix recorded for his classic 1968 album Electric Ladyland, demonstrates Jimi's close ties to his blues and R&B roots. The latter demonstrates his skill with long-form improvisation, as well as his playful sense of humor. Both tracks feature the classic Jimi Hendrix Experience lineup of Hendrix himself on guitar and vocals, Noel Redding on bass and Mitch Mitchell on drums. As with every release in the series, the new single features a color picture sleeve incorporating seldom seen Hendrix photos that capture the legendary artist's distinctive persona and pioneering spirit. This new release is the second in Sundazed Music's historic partnership with Experience Hendrix, L.L.C., which launched in April 2012 with a single featuring two rare Hendrix performances from a pair of 1967 BBC sessions. In a recording career that spanned only three and a half years prior to his tragic death in 1970 at the age of 27, Jimi Hendrix revolutionized the role of the electric guitar and radically altered the face of contemporary music. He became rock's first guitar superstar, with an effortless charisma that matched his visionary talent to an intensely original performing style. More than four decades after his passing, his influence upon contemporary music looms as large as ever. Another really good addition to the Authentic Hendrix catalogue, and to my collection! I am very pleased that Authentic Hendrix has got its vision together and is now capable of releasing archive quality recordings, and I hope it continues to mine the Hendrix legacy for many years to come.